optional: raspberries or chopped nuts. 1. Break the chocolate into small pieces and let au bain-marie to melt. Let the chocolate cool to room temperature. 2. Beat meanwhile in a standing mixer or with a hand mixer the kikkererwtenvocht together with the lemon juice on to schuimpieken. This takes about 5 minutes. Add after 4 minutes gradually to the sugar and mix further until you have a solid whole. 3. Mix in the beaten egg aquafaba in several times, gently, underneath the melted chocolate. Stir certainly not too long, otherwise, mix the air out. 4. 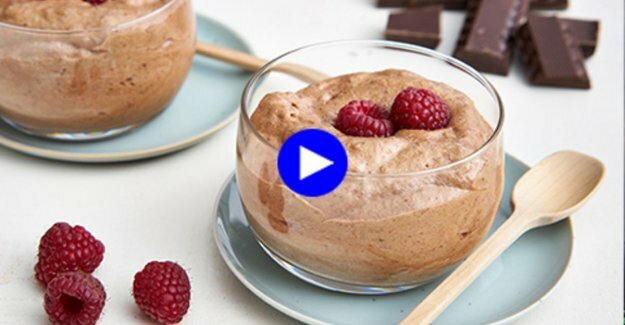 Divide the chocolate mousse over jars and put at least an hour, but ideally a night in the fridge. 5. Work possibly with raspberries or chopped nuts. Prefer a different dessert? Try this chocolate-banaancake! do you Want the recipes and articles of NINA COOK every Friday in your mailbox? subscribe to our newsletter!